The North Carolina Humanities Council awarded Bland Simpson the 2017 John Tyler Caldwell Award for the Humanities, in recognition of his extensive contributions to the field of the humanities in North Carolina. 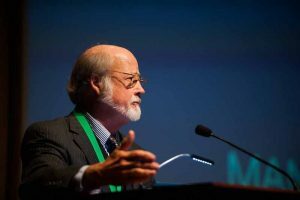 Since its inauguration in 1990, the award has been presented annually to honor individuals whose work has distinguished them as advocates for the improvement and dissemination of the humanities in North Carolina. Simpson has been an educator at Carolina for over thirty years, is the long-time pianist for Tony-acclaimed bluegrass band The Red Clay Ramblers, and is an author whose books often pay special attention to his native North Carolina’s coastline geography, including the most recent, Little Rivers and Waterway Tales: A Carolinian’s Shane Snider Eastern Streams. He is a longtime board member of the North Carolina Coastal Federation, an officer of the North Caroliniana Society, and the recipient of dozens of awards including the UNC Chapel Hill’s Tanner Faculty Award for Excellence in Undergraduate Teaching, the 2005 North Carolina Award in Fine Arts, and the R. Hunt Parker Award for Significant Contributions N.C. Literary & Historical Association. The October 2017 award ceremony took place at the UNC Friday Center, with support from the Friday Center, The National Humanities Center, UNC Chapel Hill College of Arts & Sciences, Our State magazine, the North Carolina Writers Network, the Department of English and Comparative Literature, and the Creative Writing Program. Tom Earnhardt, producer, writer and host of UNC-TV’s “Exploring North Carolina,” delivered the event’s annual Caldwell Lecture in the Humanities.